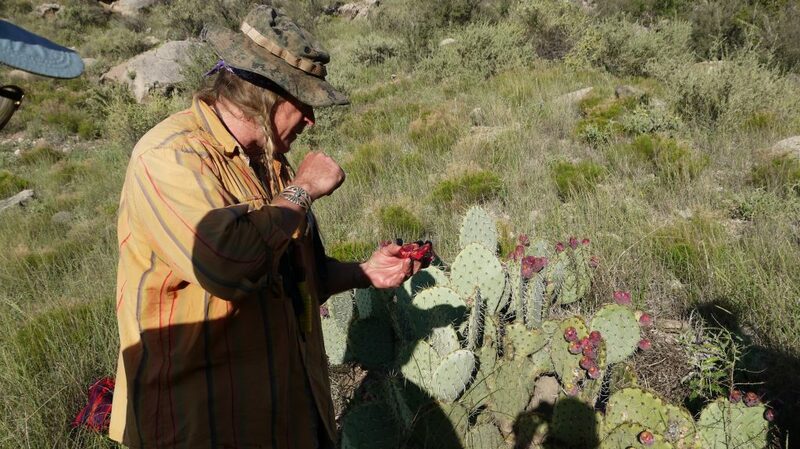 It’s been a while since I put anything on our blog (the whole growing your own food thing is somewhat time intensive especially in the spring and summer months) and this is a little out of the ordinary but I took a primitive wilderness class in Prescott Arizona at the Aboriginal Living Skills School in August 2018. Those of you who know me understand that I am an incessant researcher and I had actually dismissed this school early on but reevaluated after looking deeper. When considering wilderness type classes I looked at the school itself (location, reputation, online student comments, longevity of the school, etc.) class offerings, actual instructors (not just the head instructor(s)) and costs involved. 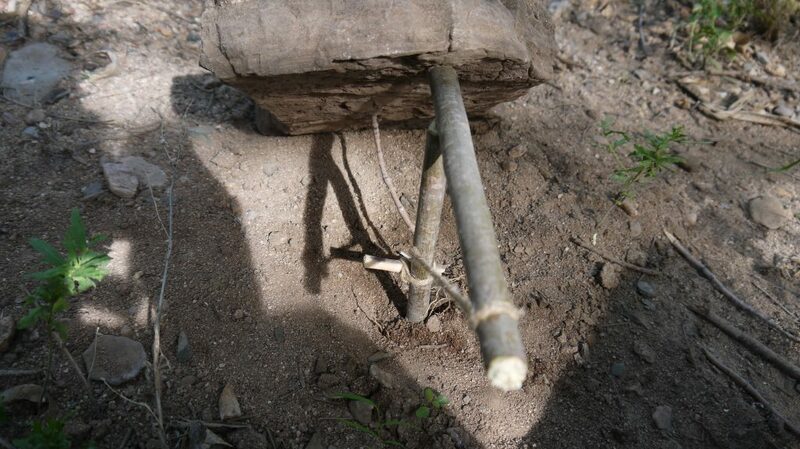 Then I decided that I wanted to go beyond the start a fire with a match or ferrocerium rod type class and work on something a little more primitive with the premise that I had nothing with me in the field except my usual surly attitude and few if any modern wilderness items. The “Provident Primitive Class” at ALSS was a perfect fit. 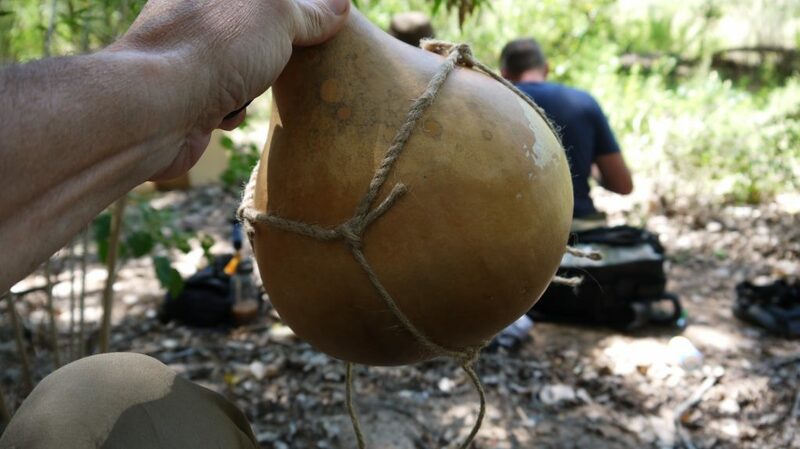 This is a no nonsense school (with a no BS guarantee http://www.codylundin.com/ALSS_guarantee.html) that will teach you many skills you can add to your primitive skills toolbox. The people who teach there live the experience and seem to truly care about each student and their learning experience. I had several correspondence with the instructors before and after the class where they answered my questions, made sure I understood their answers and kept me on the right path. Even before I left for Prescott I had decided this was where true wilderness skills were being taught (no BS) the way I wanted to learn them. With all that said, these classes are not cheap. When tuition is combined with airfare, lodging and a rental car it added up to a tidy sum. You can probably find cheaper alternatives closer to your home (I could) with a curriculum somewhat suitable for your needs but in my opinion there are only a few wilderness schools in the country that can truly convey the techniques, communicate why things are done a particular way and more importantly give you first class instruction based on personal experience and time tested knowledge. Over the years I have found good education is hard to come by and potentially priceless should you ever need it to save yourself or one of your family’s lives. These guys at ALSS know what they’re doing and know how to convey it so you can learn the skill and can take it home and practice (which is all anyone can ask). After everything was said and done, this class was worth every penny. Also please understand you will need to be in some semblance of physical shape before attempting this class, more on this later. After flying into Sky Harbor airport in Phoenix (with some “interesting American Airline issues” ) renting a car and driving to Prescott I checked into one of the hotels on the list provided by ALSS, it was not a 5 star hotel but it was very close to the school (3 minutes if you take your time) and comfortable. The next morning I got to the school 25 minutes early but was the last one there and the lead instructor Cody Lundin greeted me by name as I pulled in and was told where to park. My gear was loaded on a large 4X4, all electronics, watches, keys and wallets were locked up and we left ( did I mention there is no outside “distractions” while in the class) . After leaving Prescott it gets a little fuzzy where we went, but it was out in the middle of a long way from anywhere. Along the way my “tribe members” got to know each other and when we stopped we unloaded the gear, were handed a few tools to carry for the projects we would build later, went to the bathroom (second tree to the right), drank lots of water and off we went down the side of a small mountain. One of the first things you can’t help but notice is the stunning scenery along the way. 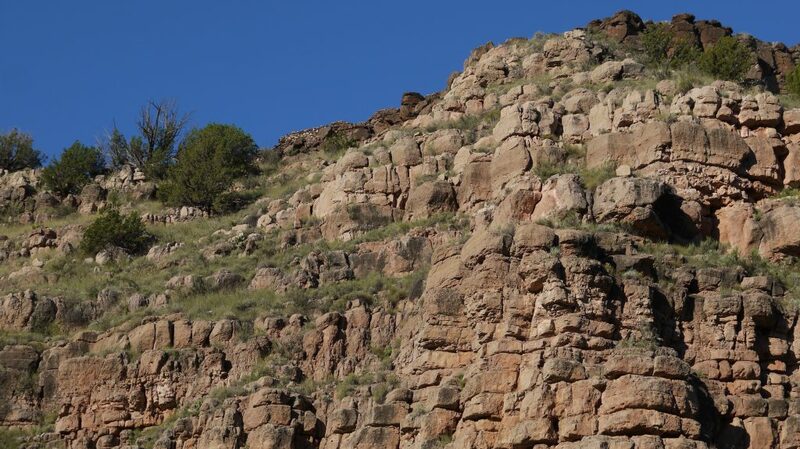 It also doesn’t take long for you to figure out walking down the side of a mountain, carrying a pack, at altitude, in 90 plus degree heat if you are in shape or not. Fortunately for someone my age (around 60) in good health (farm work will keep you in shape) I was able to make it without any major problems. 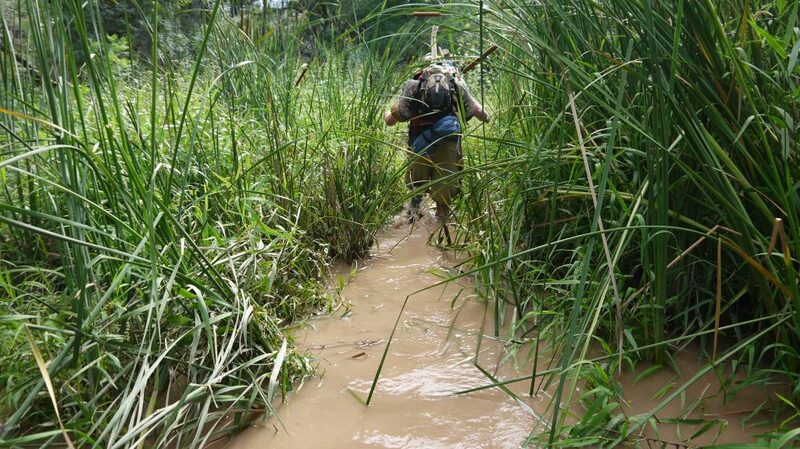 Did I mention we walked through three different streams getting to where we set up base camp? The sandals went on after the first one and didn’t come off until I was back at the hotel afterwards stepping into a much needed shower. 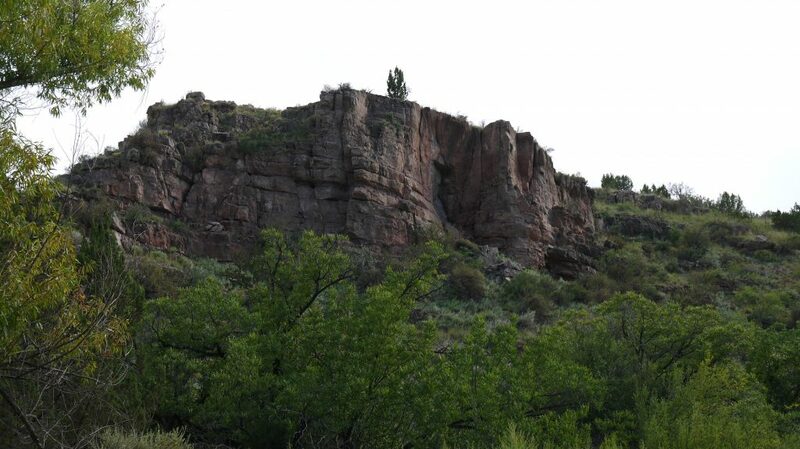 We setup base camp near the bottom of a plateau looking up at an ancient American Indian village. It was an amazing place that really set the stage for the skills classes that we went through for the next couple of days. Made a working Paiute dead fall (relatively easy to make but challenging to set). 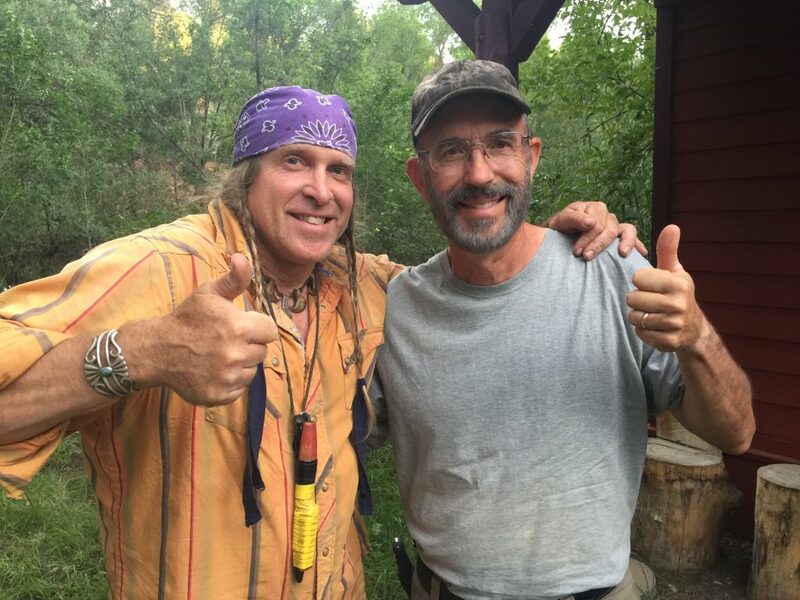 There were two instructors for the class one was Mark Dorsten a very competent outdoorsman and Cody Lundin the founder of ALSS and former Discovery channel television star. Cody is best known for the TV series Dual Survival, but in outdoor survival circles he has been a legend for many years. Both were very approachable and absolutely committed to our safety and teaching us the skills required. What was really impressive was the positive impact both instructors had on everyone in the class, they taught by example, pushed us beyond our reasonable limits and made the entire experience one for the record books. For the experience of a lifetime, I can’t recommend the classes at ALSS enough.